UPDATE: Kasten Box seems to be out of business as of 6/18/15. Their website no longer seems to be working and there has been no activity on their Facebook page since December 2014. We’re on a mission to try every dog subscription box available. We were recently sent a Kasten Box monthly dog box for our review. As with all of these services, the “surprise, you’ve got goodies” element is the biggest draw for me. The Kasten Box contains 3 – 7 premium products such, as organic treats, fun toys, an unique accessories, tailored for your pet based on a detailed profile. Kasten Pets (the company), and the Kasten Box (the product), offers two different boxes. The Value Box contains 3 – 4 high-quality products and is $30 a month. The Deluxe Box contains 5 – 7 high-quality products and is $37 a month. As with most boxes, the longer your subscription, the lower the price of each box. The products in the Kasten Box are made in either the US or Canada. After you sign up for the box you will be sent a detailed profile questionnaire so that they can choose the right products for your pup based on size, breed, and special needs. Shipping is free within the US and there is a standard shipping rate to Canada and Puerto Rico based on the city or country. The Kasten Box is currently offered only for dogs but a box for cats is in the works. My computer ate our photo of the box so check out cutie Max with his. His Mom wrote a pretty great review, with detailed photos of each item, so be sure to visit The Small Things blog and check it out (click link). The box contained 6 products – 2 toys, three edible items, and a pet coat shine mist. I was fairly pleased with the products that came in the Kasten Box. The Sweet Pea treats were organic and gluten free. Gretel had one of the Kong barbell tennis ball toys before but it died. The coat mist is not something we would use but it smelled good. The Bunny was a big hit for sure. The only negative what that there was just one. Gretel hoarded it for herself right away. There was one big “Ack!” in the box for us though – The Nylabone Dental Chew. 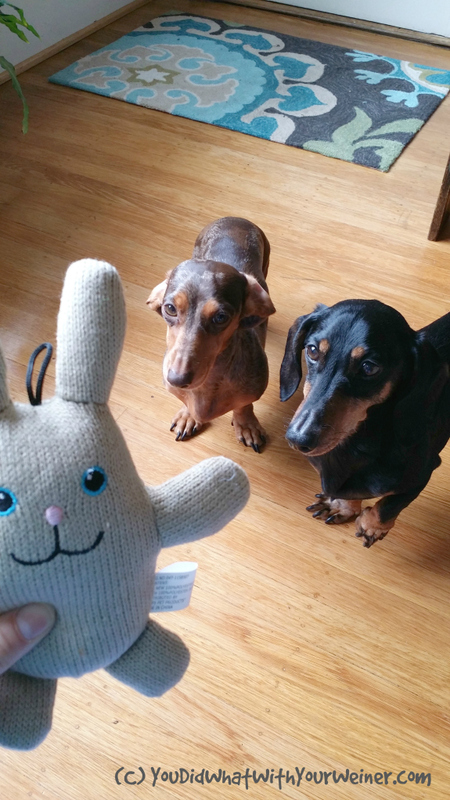 First, I never give Chester and Gretel chew toys that don’t come from an animal (as in, real food). Nylabone products are made with a soft Thermoplastic Polymer and are dyed blue! That went right into the rescue donation box. Overall, I would say the Kasten Box rated average for us. UPDATE (2/14/15): Subscription boxes come and go quickly. It looks like the Kasten Box is no longer offered. The last activity on their Facebook Page was December 2014 an their website has disappeared. I will update again if I find out they are back in business. Disclaimer: This post is sponsored by Kasten Pets. I received a Kasten Box in exchange for my honest review. Here at YouDidWhatWithYourweiner, free does not equal good so everything we say is really how we feel about the product. Kasten Pets is not responsible for the content of this article. I have never heard of this subscription box before. I’ll definitely have to look into it more! Yes. Yes there are. All of these individual reviews are leading up to a blog post where I list all of them and compare them in a chart. I wrote a post like that last year but most of the boxes in that post have gone out of business. “Box” competition is pretty intense I guess. We have never heard of these boxes before now. Thanks for the review and telling us about them. Hugs and nose kisses. My favorite thing about subscription boxes is the element of surprise. It’s like Christmas, once a month. This is a new one for me. I’ll have to check it out. I guess I’m too picky about what I give my dogs and the fosters. 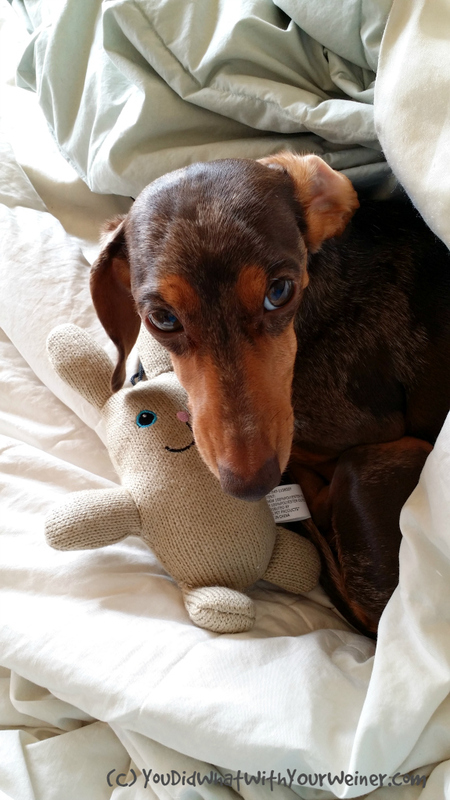 I don’t like Nylabones – I prefer cut raw femurs or Himalayan chews. I don’t let my dogs chew on tennis balls or anything fuzzy…I’ve seen dogs chew the fuzz off tennis balls and ingest the stuff. I can’t stand the smell of Kongs…woof. They only get grain-free treats and I buy toys from Petedge.com when they go on sale. So the only things I’d keep from this “box” would be the Sweet Pea treats and the Zanie toy (Pet Edge sells Zanies) so kind of expensive to pay $30 for two things. I could probably buy quite a few treats and Zanies for $30. My tastes, and access to high quality stuff, is similar to your situation. There have been some boxes I have tried where I didn’t use anything. That is why I say up front that the biggest reason to get these boxes is the surprise factor. They aren’t exactly a bargain when you don’t use everything in the box, every single time. Interesting, I have never heard of them before!